On Wednesday, we headed over to Placida, Florida to spend a few days with Diana’s cousin and his wife. Placida is on the Gulf side of Florida, so our journey was going to take us completely across the peninsula. We took State Route 70 out of Fort Pierce and headed west through the state’s agricultural land. 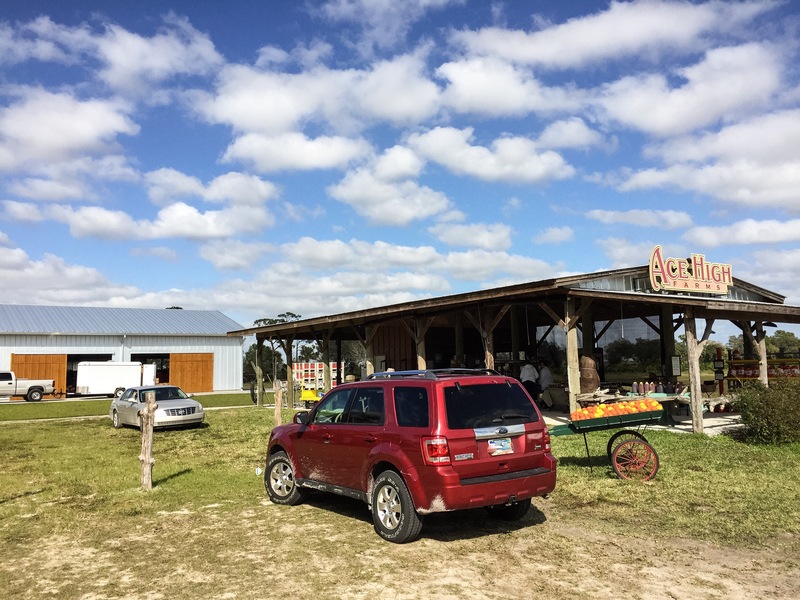 Not too far out of town, we stopped at Ace High Farms fruit stand to pick up some oranges and grapefruit. Ace High is a sixth generation family farm. Their citrus was freshly picked and it really showed, as it looked fabulous. The first thing we spotted were a few bags of Honeybells, which we knew nothing about. After questioning the owner, we purchased a bag along with two Ruby Red grapefruit. When we arrived at Placida, Diana’s cousin and his wife looked at the bag and said “Those aren’t oranges….those are HONEYBELLS!! !” In no time, we were each peeling the skin off of our fruit, juice flying everywhere. My, oh my….they were delicious! After our visit, we headed back on the same route. There aren’t a lot of choices for roads in that region of the state. It is almost completely level, and I am fairly sure that none of it exceeds 20 feet above sea level. 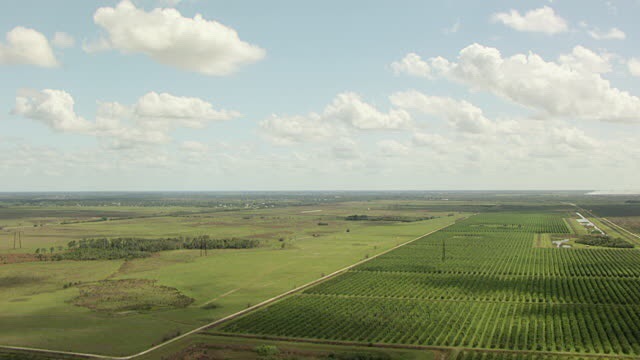 There are a lot of cattle, some sod farms, a lot of citrus groves and palm tree nurseries. Canals criss-cross the land every so often, and the soil is rich and black. 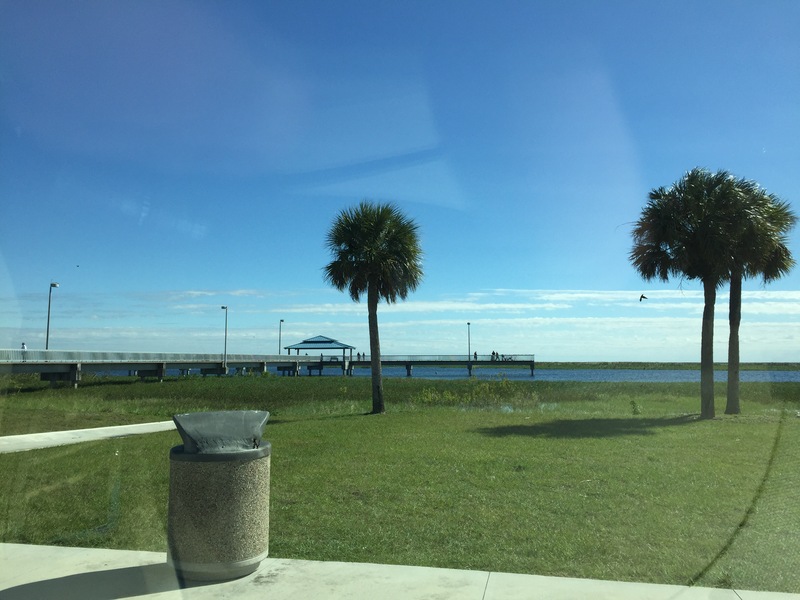 When we pulled into the city of Okeechobee, we decided to drive to the southern end of town and see Lake Okeechobee. This is the nation’s third largest fresh water lake completely within the U.S. border (Lake Michigan is #1) and it is the largest that sits within one state in the Lower 48. With that being said, the entire lake only averages over a little more than 8 feet deep, with its maximum depth just a touch over 12 feet deep. Historically, it is a natural lake that takes in water from the Kissimmee River from the north and flows southward into the Everglades. The key word being historically. This is Army Corps of Engineers territory. After a hurricane in 1928 sent a storm surge over the natural peat dam at the south end of the lake and killed 2500 people, the U.S. government stepped in. 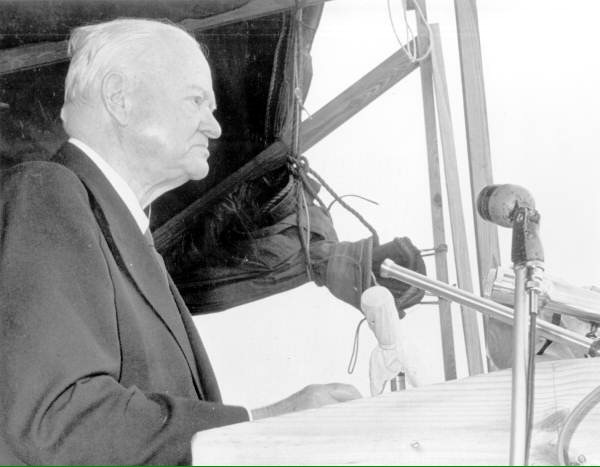 President-elect Herbert Hoover toured the devastation and after consulting the Army Corps of Engineers, proposed a dike around the lake. By 1961, the current 30 foot high dike that encircles the lake was completed, basically turning it into a reservoir. The former president was on hand for the dedication, as the project was named after him. While a lot of good has come from this dike…namely, safety from the lake’s fickle level…so has a lot of not so good. In 2008, a drought exposed large portions of the lake bottom, allowing the Corps to scrape 35,000 truck loads of polluted mud and dispose of it. Problem was, it was so contaminated by arsenic, it created a huge disposal problem. That muck wasn’t there before the dike. Currently, the water level is too high (due to El Niño), and the Corps is concerned about the dike eroding. The cure is to send the water into the canals and into the ocean and gulf, resulting in the fresh water damaging the salt water aquatic creatures and plants. It is also creating algae blooms in the ocean and gulf, otherwise known as Red Tide. As is usually the case, the more that mankind interferes with nature the more things are disrupted. What most impressed me was the sheer size of the project. I had no idea how large of an area this affected. One thing we noticed is there is a National Scenic Trail on the top of the dike. The portion we saw was asphalt, and it had plenty of folks using it. It looks like a great place for a bike ride! We will keep that in mind for the future. There was also this fishing pier where we crossed the dike, along with a nice restroom building and picnic tables. We had our picnic lunch while enjoying the views. 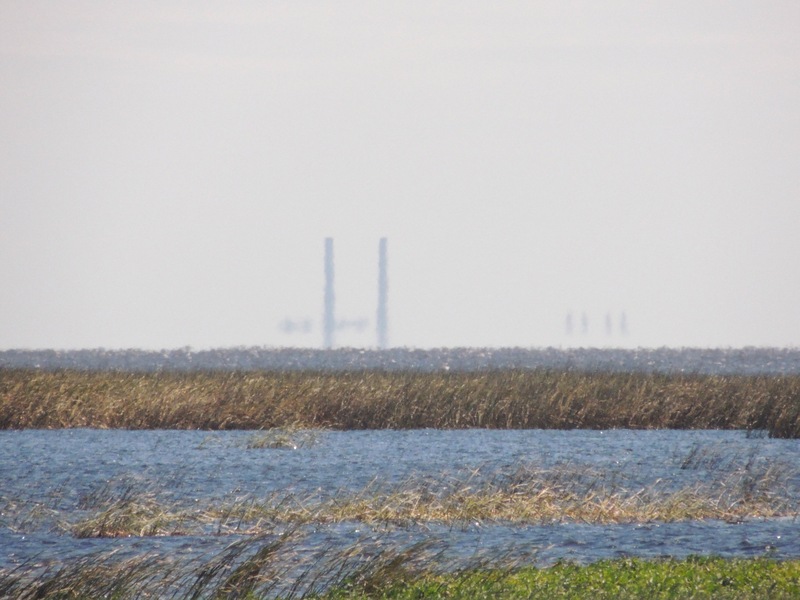 From the pier, I was able to zoom in on the smokestacks of the power plant 15 miles to the southeast. To the right of that, the lake extends another 20 miles to the south. 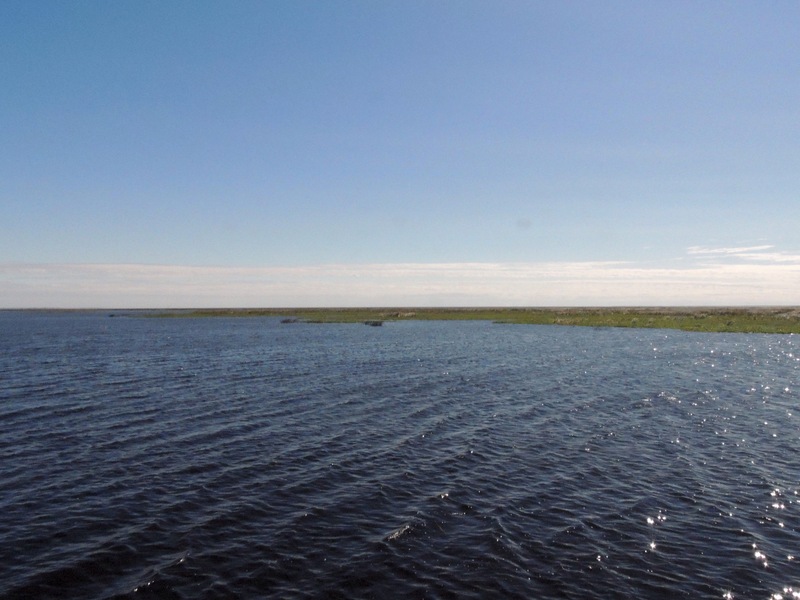 Lake Okeechobee is definitely a huge body of water! After we left Okeechobee, we stopped back by at Ace High. We were fortunate to be able to get another bag of Honeybells. Diana’s cousins are great hosts and have a lovely place for entertaining. They prefer not having their picture posted on the web, so we are honoring their wish for privacy. They were very close to Diana’s parents, so it was nice sharing old memories and making new ones. What a nice way to spend a few days! Seems so often when we humans try to improve on nature we don’t think far enough ahead. Where we were in Oregon they were fighting the effects of conservation efforts using exotic plants over 100 years ago. When we were in Gulf Shores we heard similar stories about a different exotic plant in Alabama. And while we usually enjoy the facilities provided by the CORPS they have made their share of mistakes as well. Talking about Honeybells — I came home a couple days with samples of 6 or 7 different ‘oranges’ — navels, tangerines, tangelos, I can’t even remember all the varieties and they are (or have been — haven’t finished them all yet — so different between each other). We love citrus — not sure how we’d feel in a place like AZ or NM where it might be warm but you don’t have the same access to citrus…. Hmmmm…. Yes, we saw that about that couple, Peter. Scary stuff. Try to get your hands on some Honeybells this week. They are really good! 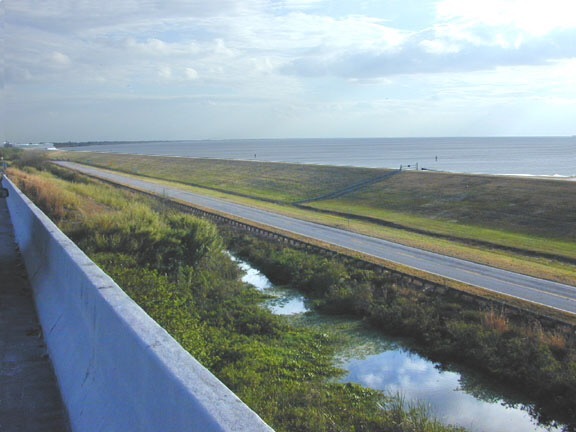 We took a motorcycle trip to see Lake Okeechobee one day a couple years ago. We really didn’t read anything about the lake at the time. Boy were we ever surprised that you couldn’t see the lake from the road. It wasn’t your typical lake. We were on the south end and there isn’t much there. Yes, it is not always a good idea to interfere with nature. 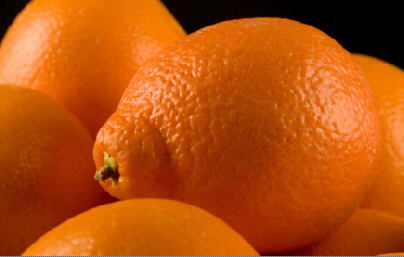 So you know about Honeybells, Pam! They sure are tasty! Yes, I’m not quite sure what to think of Lake Okeechobee. I definitely want to learn more about it. I would agree with you, but I was surprised how many RV parks were there, Pam! Having been in the grocery industry for over 30 years I am familiar with Honeybells and have had them! Lake Okeechobee is one of the best large mouth bass fisheries in the US and has some huge fish in it! Alright! You know what we are talking about, Jim! That’s good to know about the fishing. We saw one boat on the lake that day where we were. Have you had the opportunity to fish there? I fished there once many years ago while in the area for work. Hired a guide for the day, caught a few fish and had a good time. It is so fun to stop at a local fruit stand and buy directly from the farmer. We’ve brought back many bags of oranges and grapefruits from Florida. I eaten honey bells and loved them! Lucky you to be able to get some! We really liked that fruit stand, Beth. Very nice folks, for sure. Bill and I rode our bikes there last year. It was a beautiful day that day and I know we only saw a very small portion of the lake. Will make a note about the Honey Balls for next time we are in that area! Was the trail pretty decent, Kelly? Enjoying local fresh produce is another great bonus in this life – will have to look for Honeybells! At least the fact that humans are now aware of the impact of things like Red Tide, and that decisions are made with the environment in mind is an improvement. Inheriting the problems that were caused by past generations who didn’t know or didn’t care, is a huge ethical and economical burden. Hopefully we are at least not creating new ones for our grandkids to deal with. I definitely believe that we’re moving in the right direction, as far as the environment is concerned, Jodee. Will have to keep an eye out for fresh Honeybells! At least we are now aware of the impact of things like Red Tide, and that decisions are made with the environment in mind is an improvement. Inheriting the problems that were caused by past generations who didn’t know or didn’t care, is a huge ethical and economical burden. Hopefully we are at least not creating new ones for our grandkids to deal with. Oh I really love fruit farms.. I have so many good memories of them when we were in Wisconsin. The taste is generally much better compared to fruits bought in supermarkets. I will try to look for honeybells here, hehe, maybe I will get lucky and find some ! I agree completely with you. the more that mankind interferes with nature the more things are disrupted… it’s one of the reasons why we had so much flooding in the uk these past years… They try to come with anti flooding plans but it makes everything worse. Nothing better than fresh fruit, Gin! Never had Honeybells that I remember. I’ll keep that in mind if I see them! I’ve always wanted to fish that lake! Doesn’t look anything like what they show on the fishing channel though. Kind of boring? I didn’t know that info about it either, thanks for writing that. Not sure I’d eat any fish out of there either.